Great Western Railway 14 inch oak cased English fusee railway clock supplied to probably the Vale of Neath or Rhondda and Swansea Bay Railways by Hennessy of Swansea circa 1860. The oak case with a one piece convex surround, cast brass bezel, two side doors and a bottom door with the lock removed and secured by the GWR modified ball bearing catch and has an GWR ivorine numberplate 3113 screwed to it. 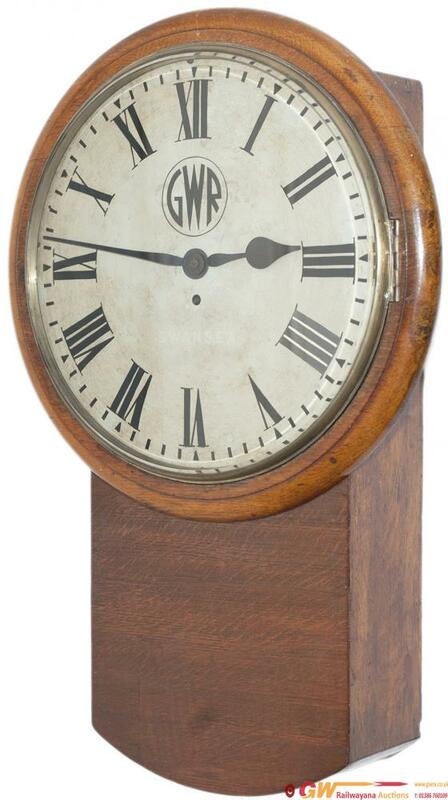 The original dial which has been lightly restored is lettered GWR in Roundel and also visible as ghosted writing is G.W.R. in block lettering and HENNESSY SWANSEA. The brass chain driven fusee movement has rectangular plates. Complete and in working condition with pendulum and key. Bernard Hennessy of 5 wind Street Swansea is associated with supplying clocks to the two Welsh pre grouping companies mentioned. An impressive clock.